The proportion of the adult population with documented tenure rights that are legally recognized by governments. The proportion of the adult population who perceive their tenure rights as legally secure, regardless of whether these rights are documented. 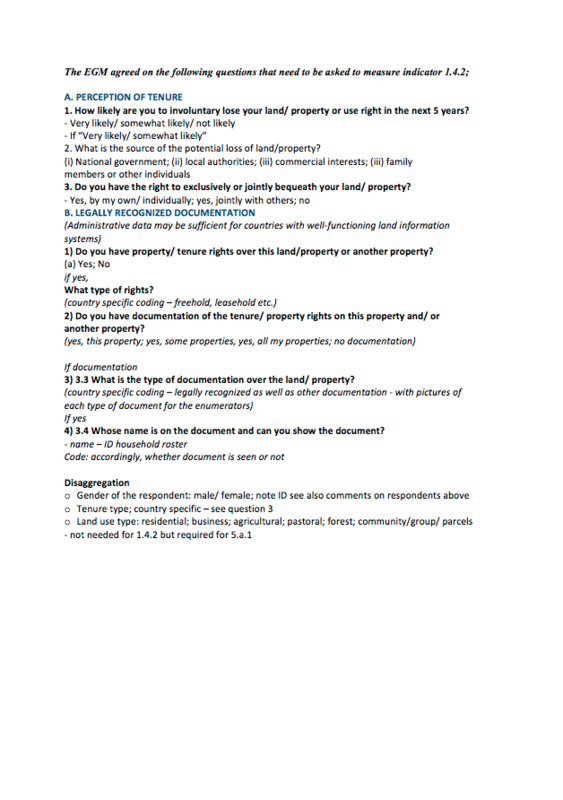 Legal documentation goes beyond land ownership by title deed and includes other legally enforceable documentation of user rights. For this component, National Statistical Offices (NSOs) will use administrative data from government registries and cadaster systems. Security of tenure is the certainty that a person’s rights to land will be recognized by others and protected in cases of specific challenges. People with insecure tenure face the risk that their rights to land will be threatened by competing claims, and even lost as a result of eviction. Measuring perception of tenure security entails capturing the extent to which individuals, households and communities perceive their tenure as secure and measuring their fears of threats to their land rights. Data on perception of tenure security will be collected through national population surveys (survey data). 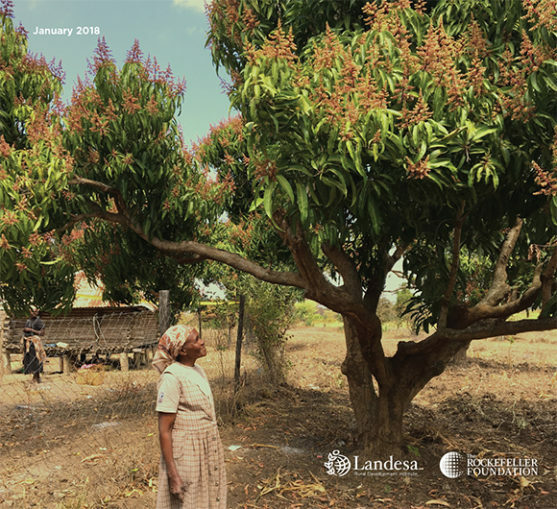 In addition to informal tenure rights holders, landholders with legally documented land rights may still feel that their land rights are vulnerable to infringement by outsiders. Indicator 1.4.2 covers both rural and urban tenure. Indicator 1.4.2 is classified by the Inter-agency and Expert Group on the Sustainable Development Goals (IAEG-SDGs) as Tier III. This means the indicator’s conceptual clarity and the methodology for monitoring the indicator is currently being developed, and the indicator’s baseline data is being compiled. GLII and the Global Donor Working Group on Land are supporting the efforts of the custodian agencies to elevate indicator 1.4.2 to Tier II status at the IAEG-SDGs meeting in November 2017. UNSD has announced that the 6th Meeting of the IAEG-SDGs will take place in Manama, Bahrain from 11-14 November 2017. Custodian agencies are expected to submit their request for reclassification including key documents in support of their request by October 2, 2017. The ultimate goal of the custodian agencies and the land community at large is to achieve a Tier I status by end of 2018, when most countries will be able to report on this indicator on a regular basis. What is the method for measuring this indicator? According to GLII- GLTN, this indicator will see countries debut the application of a globally comparable and nationally applicable land indicator. This indicator will enable the generation of globally comparable data for monitoring the proportion of total adult population with secure tenure rights to land. Countries can use data on tenure security for decision making and influencing policy in advancing responsible land governance for poverty reduction in SDG1. Comparability of data from countries will also support regional and global advocacy and influence the development of land governance policy by various stakeholders at the national, regional, and international level. Land is central to ending poverty, income and gender inequality, and contributing to food security. Securing tenure rights for all will ensure sustainable social and economic opportunities needed to eradicate poverty (SDG1), as well as contribute to the achievement of SDG2 on eradicating hunger, SDG5 on gender equality and empowerment of women, SDG11 on building inclusive, resilient and sustainable urban areas, SDG15 on reducing land degradation and SDG16 on fostering peace and security. Securing tenure rights for all is a key ingredient for the realization of responsible land governance that enables efficient and effective appropriation and use of land, regulating land concentration, fragmentation and expropriation, and enhancing the productive use of land. Monitoring land tenure security not only contributes to measuring progress on the SDGs, but also contributes to tracking of progress on other global land governance frameworks like the Voluntary Guidelines on the Governance of Tenure (VGGT) and regional initiatives like the Framework and Guidelines on Land Policy in Africa. Securing Tier II status for this indicator will also serve as great impetus for countries to prioritize monitoring of tenure security, increasing access to data for tracking the contribution of tenure security in achieving SDG1 by 2030. If Tier II status is reached, NSOs would be expected to prioritize the monitoring of this indicator over many of the other 230 SDG indicators. Tier reclassification would also mean that land tenure security would be featured in the next SDGs 2018 progress report by the UN Secretary General - a needed accomplishment that will help raise the awareness of land rights as key to achieving the SDGs. The Inter-agency and Expert Group on SDG Indicators (IAEG-SDGs) tasked UN-Habitat and the World Bank as the custodian agencies for indicator 1.4.2. These custodian agencies are developing the methodology through wider consultation with land experts, National Statistical Offices (NSOs) and other data agencies and stakeholders at country, regional and global levels to secure re-classification of this indicator from Tier III to II by November 2017 and compile the data required for classification as Tier I by the end of 2018. The Global Land Indicator Initiative (GLII)- hosted and facilitated by Global Land Tool Network at UN Habitat continues to coordinate a global land monitoring initiative involving over 50 partner organizations and other key stakeholders. GLII aims at achieving the objectives of indicator 1.4.2 and linking this indicator with other land indicators in the SDGs. The platform advocates and facilitates the coordination and harmonization of land indicators in the SDGs following an integrated approach that also promotes gender responsiveness and supports the custodian agencies for indicator 1.4.2 (UN-Habitat and World Bank) as well as other custodians for land indicators such as the Food and Agriculture Organization of the United Nations (FAO) and the United Nations Framework Convention on Climate Change (UNFCC). GLII also fosters the link between the SDGs and other global and regional land governance frameworks including the Voluntary Guidelines on the Governance of Tenure (VGGT), the New Urban Agenda and the Land Policy Initiative (LPI) for effective coordination, synergy and complementarity. The Global Donor Working Group on Land has set up an informal multi-stakeholder committee, the Friends of the Custodians, to help the World Bank and UN- Habitat to achieve re-classification of this indicator from Tier III to Tier II by November 2017 and Tier I by end of 2018. The Sustainable Development Solutions Network plays a critical role in moving the sustainable development agenda forward, including its production of a global SDGs index that land monitoring in the 2030 agenda will certainly benefit from. 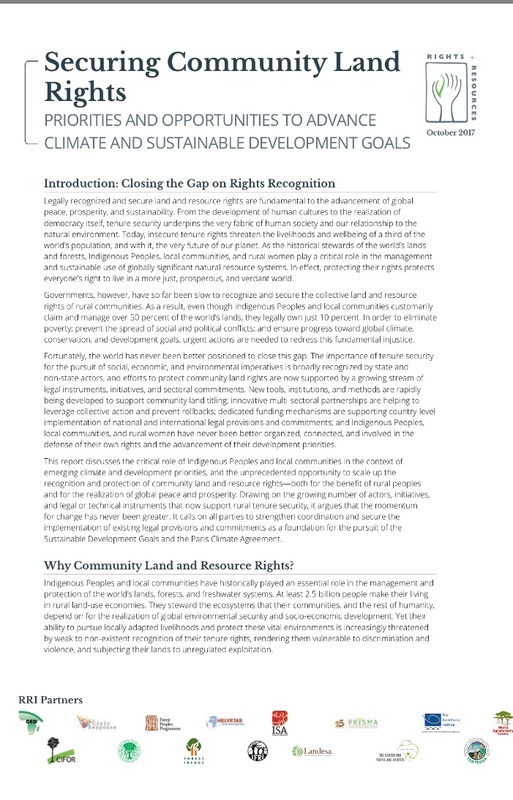 The Land Rights Now Initiative- co-convened by Oxfam, ILC, and RRI- aims at doubling the global amount of legally recognized indigenous and community land by 2020. The Global Property Rights Index (Prindex) measures citizens' perception of the security of property rights. Until PRIndex, perceptions of security of tenure had not been collected at the global level. PRIndex data is designed to encourage responsible governance of property rights by increasing awareness and understanding of citizens' perceptions of tenure security. LandMark is the first online, interactive global platform to provide maps and other critical information on lands that are collectively held and used by Indigenous Peoples and local communities. National level data published on LandMark shows two categories of information for a country: 1) the amount of land held or used by Indigenous Peoples and communities as a percentage of the country’s total land area, and 2) a snapshot of the legal security of indigenous and community lands based on a review of national land and resource rights laws for each country. This indicator expresses the percentage of total respondents feeling "secure". This indicator expresses the percentage of respondents feeling "somewhat insecure". This indicator expresses the percentage of respondents feeling "secure". This indicator expresses the percentage of respondents who personally own their homes -- urban residents only -- with informal documentation only. This indicator expresses the percentage of respondents who personally own their homes -- urban residents only -- with formal documentation. Land governance covers all activities associated with the management of land and natural resources that are required to fulfil political and social objectives. Good and transparent land governance will serve a country's national resources management, the rights of its citizens, and lead to a reduction of poverty. In addition, sound land governance is crucial to achieving relevant sustainable development goals (SDGs). Land is the maker and the marker of the Sustainable Development Goals (SDGs). For the Dutch Ministry of Foreign Affairs (MFA), our aim is to contribute squarely to relevant land-related results where solutions exist and actions are needed, which is at subnational or national levels in countries. We work with national and local governments as well as with other locally mandated actors that in most cases get assistance from international organisations . This report presents the results of the multi-country assessment carried out in 17 countries across the world. 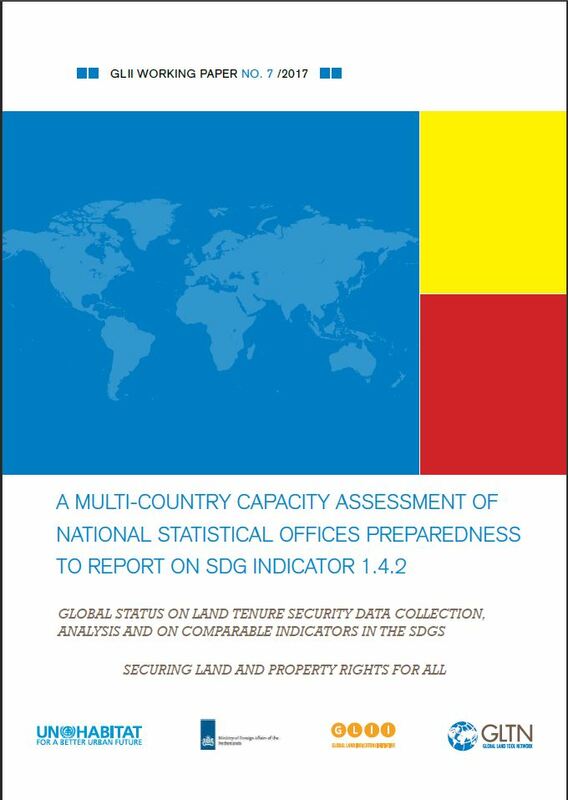 The findings of this assessment is expected to directly inform the work of the co-custodian agencies for land Indicator 1.4.2 (UN-Habitat and World Bank) in formulating a coherent capacity development strategy for NSOs at country level, and strengthen their collaboration with land agencies for enhanced data infrastructure needed to regularly report on this indicator. The document details the agreements of the Expert Group meeting on a set of defined questions that need to be asked in order to properly measure 1.4.2. Legally recognized and secure land and resource rights are fundamental to the advancement of global peace, prosperity, and sustainability. From the development of human cultures to the realization of democracy itself, tenure security underpins the very fabric of human society and our relationship to the natural environment. Today, insecure tenure rights threaten the livelihoods and wellbeing of a third of the world’s population, and with it, the very future of our planet. This bulletin is prepared by the Friends of the Custodians Committee. 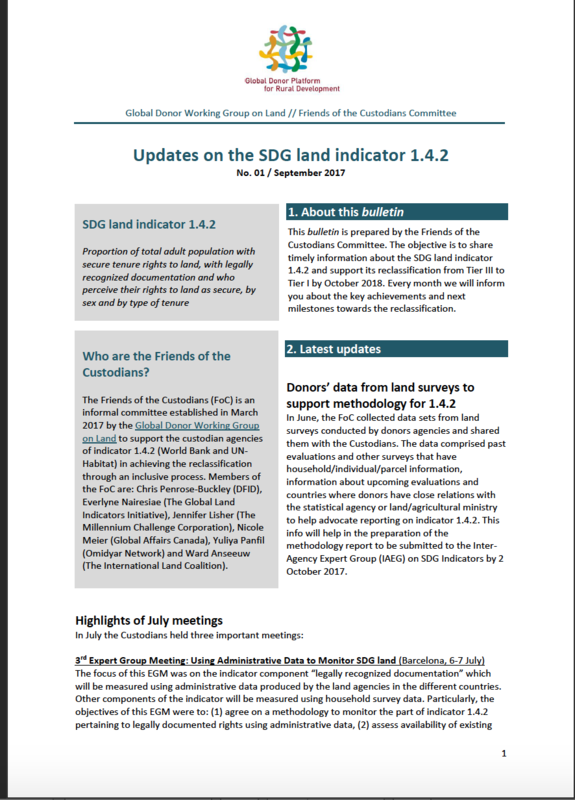 The objective is to share timely information about the SDG land indicator 1.4.2 and support its reclassification from Tier III to Tier I by October 2018. The indicator is conceptually clear, has an internationally established methodology and standards are available, but data is not regularly produced by countries. Experts reach consensus on measuring Indicator 1.4.2. Experts agree on a set of household survey questions that will be included in the global and national-level surveys and censuses to measure how secure peoples’ land and property rights are. Global Donor Working Group on Land (GDWGL) confronts IAEG-SDG recommendation to delete Target 1.4. Particularly, the objectives of this EGM were to agree on the methodology to monitor indicator 1.4.2 pertaining to legally documented rights using administrative data and to assess availability of existing data and explore ways of institutionalizing reporting at country and regional level. Particularly the objectives of this meeting have been to review tier classification. The work of those in the land sector came to fruition when indicator 1.4.2 was finally bumped from Tier III to Tier II status. The International Fund for Agricultural Development (IFAD), a specialized agency of the United Nations, was established as an international financial institution in 1977 as one of the major outcomes of the 1974 World Food Conference. The Conference was organized in response to the food crises of the early 1970s that primarily affected the Sahelian countries of Africa.